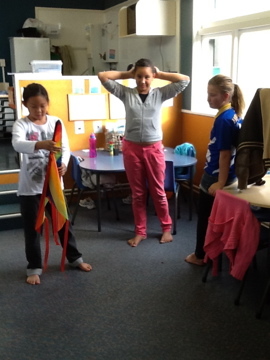 It's very exciting to be starting another MOTE adventure with HNS school. This is the fourth, or is it fifth time I have had the privilege of working with staff and students of this school (I'll only identify it as HNS, for privacy reasons - but it's a local primary school - high decile - a "normal" school - ie one in which student teachers are regularly placed on practicum). For six weeks each year the good folk of HNS accommodate me and my third year teaching students, allowing us to have our weekly classes in one of their classrooms - with real children! We go in on a Tuesday and the classroom teacher continues with the mantle thereafter, until we return. It's SUCH a good set up... everyone seems to get something out of it. For myself, it's a chance to keep practising what I preach and developing my understandings of MOTE. My student teachers get to watch a MOTE in action, and contribute to the planning as well. 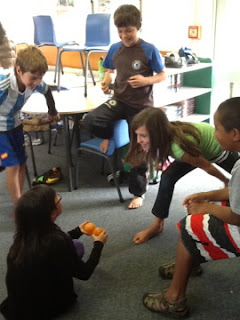 The classroom teacher gains some professional development and the children get to learn through dramatic inquiry AND benefit from all interacting with all these teachers in the classroom. It's a model that really works and it's something I am very grateful to the principal, deputy principal and teachers for. So this year myself and my five third year students are working with a young male teacher - Andy, and his year six class. We start on Tuesday, and I will be blogging regularly to record what happens and my reflections on the process. You may also see comments from student teachers and from Claire - a PhD student from Auckland who is observing the process as part of her research. Phew, quite a team! To begin I thought I might talk a bit about the preplanning process. This began several months ago when I first met up with the Deputy Principal, Andy and his class. As always, planning began with thinking about what really interests the children - alongside consideration of the curriculum areas Andy wanted to explore this term. In this discussion, Andy told me that the school-wide focus for the term would be "sustainability" - so this would be a good umbrella concept to consider. Andy shared with me the results of a classroom survey in which children listed their interests - they were asked questions like "what would you most like to learn about at school?" and "what are your interests?" and even "what are the most important things that we have to learn at school?" Out of this survey we saw some clear themes emerging: 'technology' 'animals' and 'making things' were standouts. As a drama lecturer I was pleased to see how many children identified 'drama' as a thing they would like to do at school... this probably relates to their enjoyment of the school production, which occurred last term. 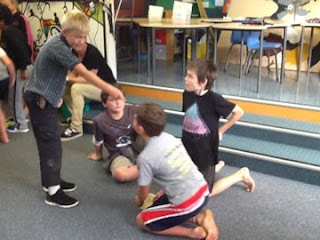 Towards the end of last term I visited the class and spent a couple of hours getting to know the children, playing simple drama games (the 'prop' game, and 'yes let's amongst others) and learning from them about their class rules. Here are some photos of the children engaged in the drama games. 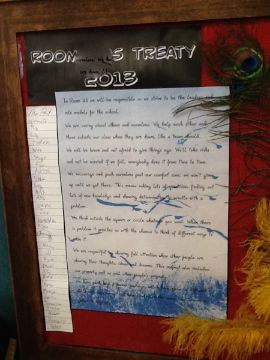 One of the children kindly took a photo of the class treaty for me - so I could remember the rules for this class and share them with the student teachers. We initially thought our company might be commissioned to create an enclosure for a baby white rhino... with the challenge being to make it seem to the baby rhino and its mother that they actually live out in their natural habitat. Perhaps we could be commissioned to build an aquarium environment for dolphins, as part of the breeding programme? .... we got excited about this idea - especially when we discovered on Google that it takes a year for mothers and babies to bond. This could be the reason for our commission. But then we questioned whether all the children would be excited about this idea... we seemed to have lost an edge of excitement in shifting from rhino to dolphin. What else could we find that had the appeal of a rhino. Someone suggested sharks... and that led us to the Dumb Golper (Gulper) shark. Brief research into this shark's life quickly made us feel like it was a useful subject matter for our adventures. The shark is scary enough to look at without being terrifying. It is extremely endangered and rare - which helps justify the need for our fictional company. Also, we discovered it is highly prized for its liver oil.... this immediately rang bells for a possible tension in the drama. So, Dumb Gulper it was! What if.... the mother shark in the tank shows signs of guessing.... What if someone sets the temperature wrong on the tank where a shark is being held.... What if the audio recording from the bottom of the sea is useless because of extraneous noises... can we reproduce the sounds accurately? What if the artificial sediment for the bottom of the tank is the wrong PH value... What if discover that we are being funded by a company with an interest in liver oil products.? All this brainstorming helped us to plan possible curriculum tasks and we roughly scoped out where in the six weeks different aspects might arise. Having said this, we remain open to surprises and different directions. As I write this, the student teachers are busy preparing artifacts for the sessions ahead (including letters from grateful clients the company has helped in the past). Andy has created an online resource with all the information about Golper sharks we can muster - ready for in-class inquiry. I am drawing up a bubble map to show the overview of how the mantle might proceed. We've also planned a wonderful dramatic hook (more about this next time). A week today - we will begin! WOW - this sounds fantastic. I look forward to reading the blog as you journey through the world of the Dumb Gulper Shark. Happy swimming!